These little treats aren't part of the March finishing frenzy; I made them last month for a friend's birthday, but her birthday dinner kept getting pushed back. I finally handed them over on Saturday night, and they were a big hit. We all know the feeling of giving something handmade and having the recipient be less impressed than we would like. 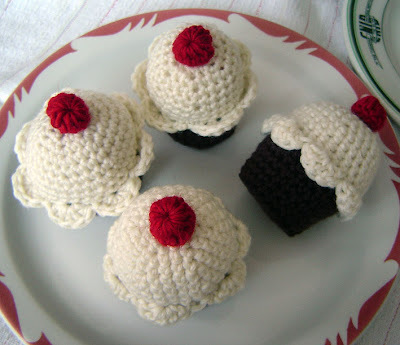 However, my friend Bernie has a special place in her heart for food made from yarn, and she may have even squealed with delight upon opening the bakery box in which I'd nestled her crocheted cupcakes. Yay! oh my gosh those are so cute!! Makes me want to eat some! 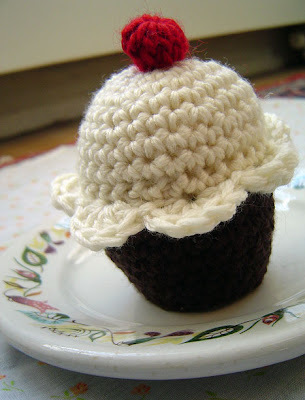 Too bad I can't crochet for the life of me...! Yummy! What a sweet treat. 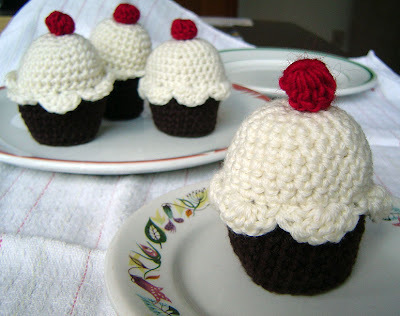 Gosh, when I'm hungry even crocheted pastries look completely edible. Yummy! Oh, how they kill me with their sugary cuteness! Adorable! And they look perfectly edible to me. Good thing I didn't see these before going to the supermaket! Really really cute, and I love how you said you packaged them! I remember your first forays into the crochet. Now, look at you, cooking up cupcakes good enough to eat! That's adorable, what a clever idea. The French Photoshop whizes in the Studio where I'm working these days thought these were real cupcakes. Way to make 'em drool!